Hong Kong may have the nightlife and the financial sector. Shanghai has the high fashion and trendy arts scene. But don’t discount the Chinese capital, which has emerged from decades of isolation to become one of Asia’s most dynamic, fascinating destinations. With plenty of world-famous sights like the Forbidden City and nearby sections of the Great Wall of China, not to mention centuries of history, cutting-edge design districts and a food and nightlife scene that is getting more fun by the day, Beijing should be at the top of your list and is our Destination of the Week. No visit to Beijing is complete without a day at Tiananmen Square and the Forbidden City. Unrecognizable from what it was 20 years ago, or even just a decade, Beijing has become a world city seemingly overnight thanks to economic development, foreign investment and its stint as host of the 2008 Summer Olympics. The city is now one of Asia’s (and the world’s) top destinations and can keep you busy for days exploring its various neighborhoods. No visit to Beijing is complete without spending a day in and around Tiananmen Square, the nerve center of Communist China. Take time to crisscross the enormous square’s expanse, snapping photos for yourself and all the Chinese tourists that are bound to ask you for a souvenir photo. 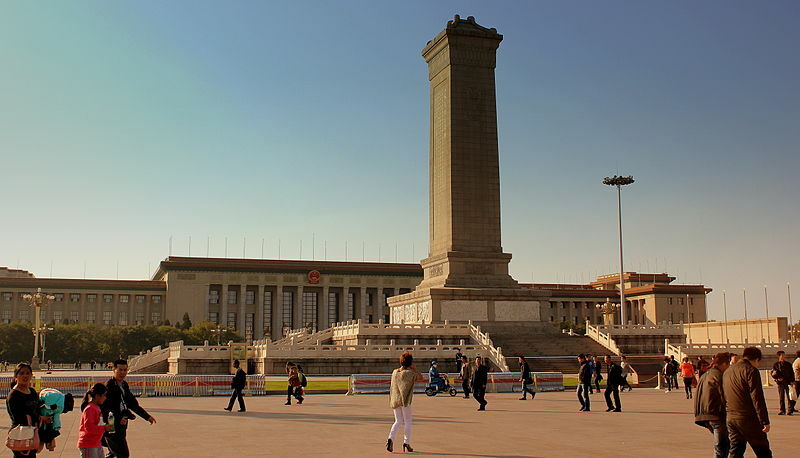 Although many visitors skip them, the square is surrounded by museums including Mao’s Mausoleum (the line can get quite long) and the Beijing Working People’s Cultural Palace, which are worth a visit. Tiananmen Square’s vast footprint is awe-inspiring. 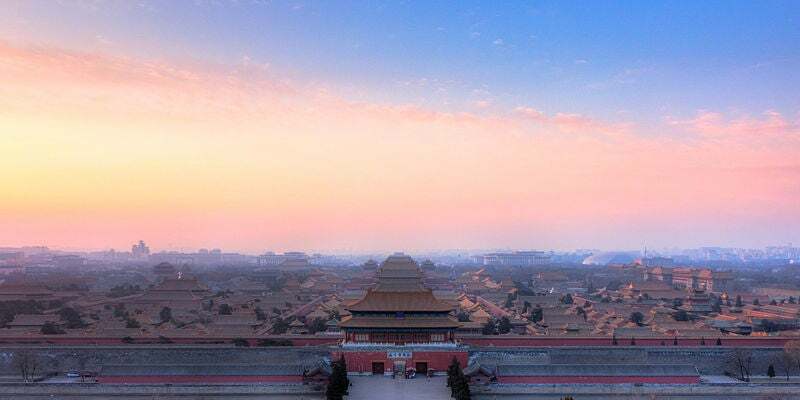 For a sharp contrast, follow the crowds to the north side of the square, walk through the tunnel and get in line to visit the Forbidden City, the vast complex of palaces, storehouses, barracks, temples and offices that housed the imperial government of China for centuries. You’ll traverse courtyard after courtyard of magnificent architecture, check out the emperor’s former living quarters and visit some idyllic gardens and parks along the way. The sheer scope of China’s imperial power is on full display and is at times overwhelming. The visit can be done in a couple hours, but spend a full day to see as much as possible. 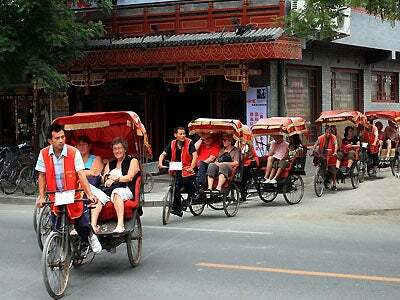 Take a rickshaw tour of one of Beijing’s traditional hutongs. Time for a change of pace and a glimpse into a facet of everyday Chinese life that is fast disappearing. Take a tour by foot, bicycle or rickshaw (the most fun) of one of Beijing’s hutongs, or traditional neighborhoods, where you can dodge merchants and bikes careening down the narrow, winding alleys and even enjoy a traditional lunch and a chat about life in Beijing with a local family. Check out Beijing’s evolving arts scene at District 798. 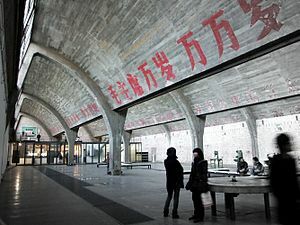 The city’s (and indeed the entire country’s) arts scene has been growing by leaps and bounds, and to get a little taste of what’s new and interesting, head about a half-hour northeast to the district of Dashanzi where you can visit District 798, a former factory complex that now houses a myriad of galleries, studios, shops, cafes and a small contemporary arts museum. Many of the city’s fine restaurants are in hotels, but venture out to the popular Sanlitun neighborhood where you can sample delicious (and for the most part quite safe) street food with the locals before hitting the area’s clubs and bars with the city’s young glitterati. Among the top spots is Q Bar, a rooftop bar within the Eastern Inn Hotel complex where the crowd consists of mid-twenties scenesters swilling top-shelf cocktails. The views of the city skyline at night are among the best in town. The Opposite House boutique hotel nearby also has a couple chic restaurants and bars while the Kerry Hotel‘s bar (also nearby) is popular with young professionals who come for the creative cocktails and nightly live music. For something more cultural to do in the evening, consider taking in a performance of Beijing Opera – a highly stylized, colorful and rich art form the city is known for at the magnificent National Centre for the Performing Arts. 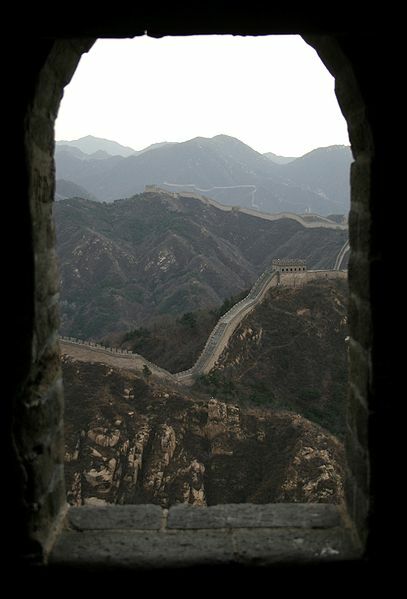 Take some time to head out to a section of the Great Wall like Badaling. Of course, one of the best things about visiting Beijing is its proximity to stretches of China’s most famous sight, the Great Wall of China. With parts of it dating back over 15 centuries, the Chinese government has restored sections of it to resemble the wall in the wall as it would have appeared at its apogee in teh 14th century. The Badaling section is among the most visited thanks to its proximity to the city (about 40 miles), while just a bit farther, the Mutiyanyu section is slightly less touristy and known for picture-perfect views of the surrounding hilltops and the watchtowers that punctuate the wall at intervals. On the way back to the city, stop for lunch or a snack at the Schoolhouse Restaurant in the village of Mutianyu for a delicious, seasonal lunch and a visit to their glass-blowing workshop before your drive back. Spend some time shopping the Silk Street Market. Finally, once you’ve gotten your dose of culture and history, head to the bustling Silk Street Market, which contains over 1,600 stalls where you can haggle over everything from home furnishings and toys to fine jewelry, clothes and electronics (bring an extra suitcase). While you’re around the area, stroll by Rem Koolhaus’s now iconic, angular CCTV tower for a glimpse at the “new” Beijing. Have more suggestions of what to see and do? Share them in the comments below! Aerial view of Beijing Capital International Airport. 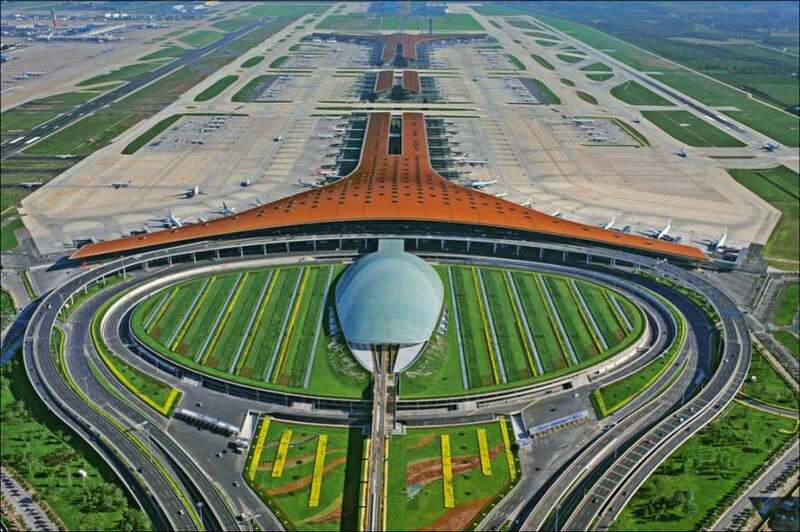 Beijing Capital International Airport (PEK) was named the second busiest airport in the world in 2012 and rightfully so since its three terminals serve flights from almost 90 different airlines and is the hub for Air China, Hainan Airlines and China Southern Airlines. In terminal 1 you will find Hainan Airlines’ domestic routes. Terminal 2 houses China Southern, China Eastern, and Skyteam members. And Terminal 3, which was built in in 2008 for the Olympic Games, serves Air China, Star Alliance and Oneworld members. American Airlines serves Beijing direct from Chicago O’Hare while British Airways flies direct from London-Heathrow. Oneworld members also include Cathay Pacific from Hong Kong, Finnair from Helsinki, and Japan Airlines from Tokyo. You can get to Beijing on Sky Team member airlines including: Air France from Paris, Delta from Detroit, Seattle or Tokyo Narita, KLM from Amsterdam as well as China Eastern, China Southern, Korean Air, Vietnam Airlines and Xiamen Airlines. With Star Alliance you have many options like United from Chicago, Newark, San Francisco and Washington-Dulles; Air Canada via Toronto or Vancouver; Air China, ANA, Asiana, EgyptAir, LOT, Lufthansa, Scandinavian, South African Airways, Swiss, and Thai. When travelling to and from the airport you can get a taxi outside each of the three terminals. The minimum charge will be RMB 10 ($1.63),which will cover the first 3km and you will be charged 2 RMB ($0.33) per kilometer thereafter. You will be charged an additional 50% of the total fee if the ride exceeds 15km. Make sure you pay attention to the charge standard on the window of the taxi. The airport shuttle price ranges from RMB 40 ($6.52) per person if travelling to Langfang (midway between Beijing and Tianjin) to RMB 140 ($22.83) if travelling to Qinhuangdao (about 300 km east of Beijing). 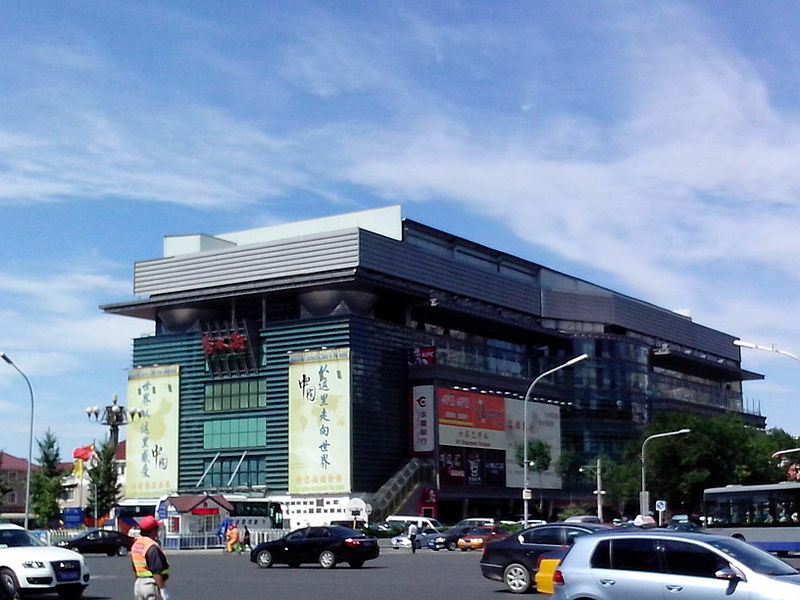 You can also utilize the three railway stations in Beijing (Beijing Railway Station, West-Railway Station and Beijing South Station) to get where you need to go. To reach the stations, take Line 3 of the Airport Shuttle to Beijing Railway Station and Line 7 to West-Railway Station. Getting to Beijing South Station from the airport is a little more difficult so you’d probably be better off taking a cab there. Royal Club room at the Radisson Blu Hotel, Beijing. Radisson Blu Hotel, Beijing: Located in the central business district of Chaoyang, this hotel is close to many tourist attractions like the China International Exhibition Centre, the Lama Temple, and the China National Opera House. With 360 standard, deluxe and Royal Club rooms, all guests can enjoy free internet among other amenities. Guest services offered by the hotel include car rental, child car, courier, currency exchange shop and a tailor. Nightly rates in June start at 1050 CNY ($171) for a standard room. Redeem 28,000 Gold Points per night or choose the Gold Points and cash option for 5,000 points and 630 CNY ($102). Club Carlson has a few other properties within Beijing: Park Plaza Beijing Wangfujing (44,000 points per night), Park Plaza Beijing Science Park (28,000 points per night), and Park Plaza Beijing West (38,000 points per night). Executive Junior Suite at the Hilton Beijing. Hilton Beijing: This property is located in Chaoyang, Beijing’s central business district, and features 502 guest rooms and suites. The rooms are decorated in earthy tones and have wood paneling, along with all the usual amenities. Guests staying in executive rooms have access to the executive club lounge serving drinks and snacks all day. The hotel has a fitness center, indoor swimming pool, sauna, squash court, and five unique restaurant and bar areas. Room rates start at 980 CNY ($160) per night in June. This is a Category 5 property and requires 40,000 Hilton HHonors points for a free night redemption in June (30,000-40,000 seasonally). Guest reception at the Conrad Beijing. 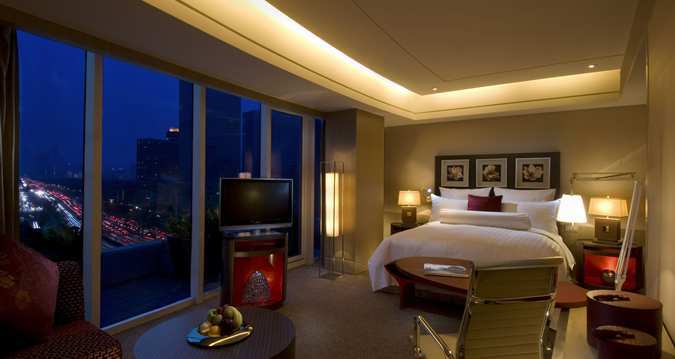 Conrad Beijing: This property has 289 contemporary guest rooms which offer views of the city or of Tuanjie Lake Park. 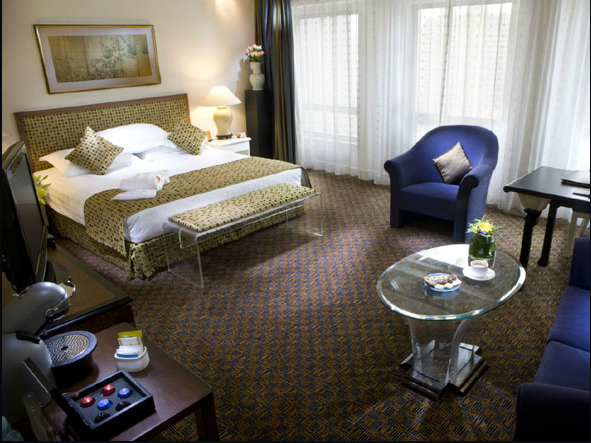 The rooms have 46-inch LCD televisions, Nespresso coffee makers, iPod docking stations, and marble bathrooms. 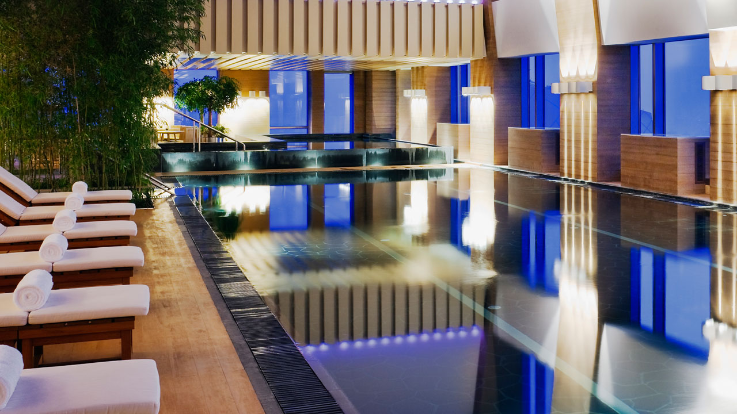 The property offers an indoor swimming pool, whirlpool, fitness center, as well as The Spa at Conrad Beijing. There are a variety of dining options on-site including 29 Grill, Lu Yu, and Vivid. Room rates start at 1,200 CNY ($195) per night in June. This is a Category 8 property and requires 70,000 Hilton HHonors points for a free night redemption (40,000-70,000 seasonally) in June. Other Hilton properties include the Hilton Beijing Wangfujing, Hilton Beijing Capital Airport, DoubleTree by Hilton Hotel Beijing, and the DoubleTree by Hilton Hotel Langfang. There are also plans to open a Waldorf Astoria in Beijing in 2014. King guest room at the Grand Hyatt Beijing. 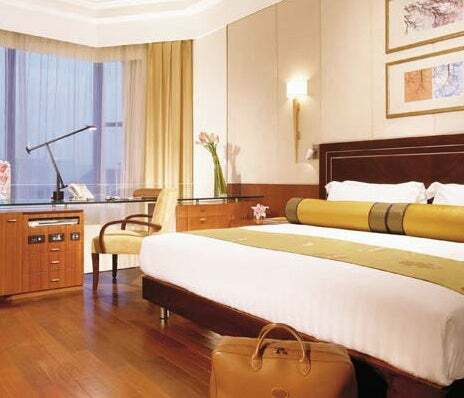 Grand Hyatt Beijing: Located near the Wangfujing area, this property features 826 guest rooms including 91 suites. The understated rooms have white linens, flatscreen televisions, wireless internet and marble bathrooms. The property is home to Club Oasis Fitness Center and Spa, which has a large workout area in addition to the 55-meter, resort-style indoor swimming pool, whirlpool, steam room and sauna. The hotel has a large assortment of restaurants such as Da Giorgio, Redmoon, and Made in China to name a few. Rates in June start at 1360 CNY ($220) per night. As a Category 4 property, free nights are available for 15,000 points per night. Indoor lap pool at the Park Hyatt Beijing. 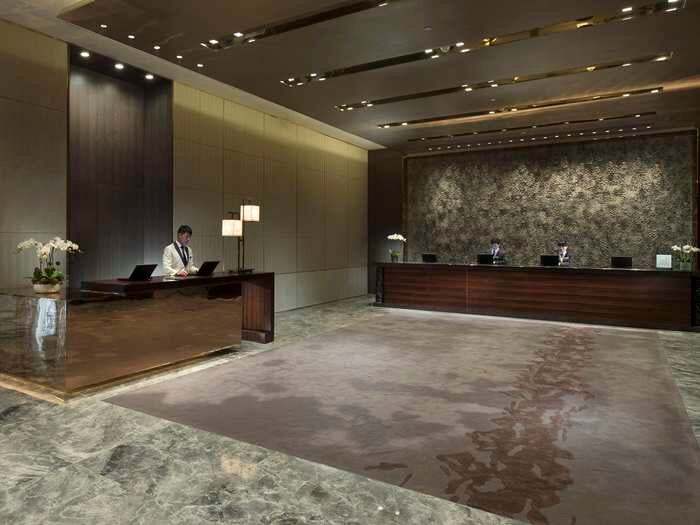 Park Hyatt Beijing: This property is located in Chaoyang, and boasts 287 guestrooms including 18 suites. The rooms have flatscreen TV’s, wireless internet, and the bathrooms feature rain showers and soaking tubs. In addition, there is the Tian Spa and a 25-meter indoor lap pool, steam rooms, sauna, and fitness center. Located on the 66th floor, the hotel’s main restaurant, China Grill, offers Western grill-style dishes, regional Chinese seafood and Japanese sushi with great views of the city. Rates in June start at 2,240 CNY ($365) per night. As a Category 5 property, free nights are available for 18,000 points per night. King guest room at the JW Marriott Hotel Beijing. 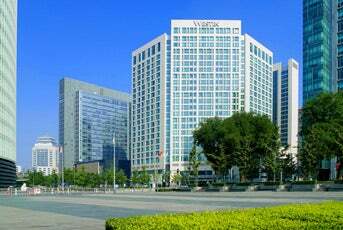 JW Marriott Hotel Beijing: This property is located in the central business district and features 542 guest rooms and 32 suites. Rooms have a contemporary oriental design and come equipped with all the modern amenities such as 42-inch flatscreen TV’s, iPod docking stations, and wireless internet. Guests staying in executive rooms have access to the executive lounge which serves a complimentary breakfast, and drinks and snacks throughout the day. The hotel has an indoor swimming pool, steam room, 24-hour fitness center and spa. Some of the hotel’s restaurants include Nobu Beijing, Beijing Baking Company, and CRU Steakhouse. Rooms start at 1,500 CNY ($245) per night in June. This is a Category 4 property and requires 20,000 points for a free-night redemption. Lobby area at the Ritz-Carlton Beijing. 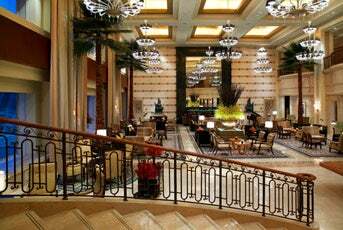 The Ritz-Carlton, Beijing: This 305-room property is located in Beijing’s commercial Chaoyang District. The hotel features club level rooms, which have access to the club lounge serving five daily complimentary food and beverage presentations. Located on the top floor is the Ritz-Carlton Spa Beijing, which has 11 treatment rooms and an indoor swimming pool. The hotel has a variety of dining options including their International restaurant, Aroma, and their Chinese-inspired establishment, Yu, to name a few. Rooms start at 2,100 CNY ($340) per night in June. This is a Tier 1 Rewards property requiring 30,000 points for a free-night redemption. Other Marriott properties include the Beijing Marriott Hotel City Wall, Renaissance Beijing Capital Hotel, Renaissance Beijing Chaoyang Hotel, Beijing Marriott Hotel Northeast, Courtyard Beijing Northeast, and the The Ritz-Carlton Beijing, Financial Street. Indoor pool area at the InterContinental Beijing Financial Street. 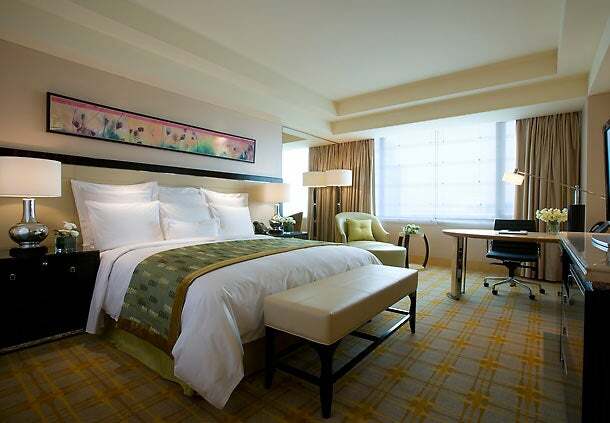 InterContinental Beijing Financial Street: This property boasts 318 contemporary guest rooms and suites. The hotel also offers executive club rooms which have access to the 6th floor club lounge serving complimentary breakfast, afternoon tea, and an evening happy hour cocktail. The hotel has a full-service spa, fitness center, and a business center. Dining options include Steak Exchange Restaurant & Bar, ZEN, a Cantonese-style restaurant and Monsoon serving international cuisine. Rates in June start at 1,900 CNY ($310) per night. This is a Category 5 property and requires 30,000 Priority Club points for a free-night redemption. Other Priority Club properties include the InterContinental Beijing Beichen, Crowne Plaza Beijing Wangfujing, Crowne Plaza Beijing Chaoyang U-Town as well as over 15 Holiday Inn and Holiday Inn Express properties around Beijing. The exterior of the Westin Beijing Financial Street. The Westin Beijing Financial Street: Sitting in the middle of Beijing’s financial district, this property has a total of 486 rooms, 49 of which are suites. Grab a bite to eat at one of the hotel’s many restaurants whether it be Chinese at Jewel, Italian at Prego or international cuisine at Senses. Be sure to check out the hotel’s Heavenly Spa by Westin, the Westin WORKOUT Gym and the business center for all your office needs. Other hotel amenities include airport transportation, valet parking, dry cleaning and laundry service, beauty salon, indoor heated swimming pool and the Westin Executive Club Lounge accessible only to SPG Platinum members and guests staying in the club rooms or suites. Room rates in June start at CNY 1,000 ($163) per night. This is a category 5 hotel where you can redeem 10,000 Starpoints for a free night. Dine at the Garden Lounge in the St. Regis Beijing. The St. Regis Beijing: Just a short drive away from some of Beijing’s most iconic sites like the Forbidden City, Tiananmen Square and The Great Hall of the People, this property is in the center of the diplomatic and commercial district. With 258 guest rooms, standard amenities in each room class include a 42-inch LCD TV, satellite channels, daily newspaper, a signature bed with luxury linens, 24-hour private dining and a business-friendly work desk though high speed internet access will cost you CNY 80 ($13) per day (unless you’re SPG Gold or Platinum). Room rates in June start at CNY 1,260 ($205) per night, or as a category 5 hotel you can redeem 20,000 StarPoints for a free night. 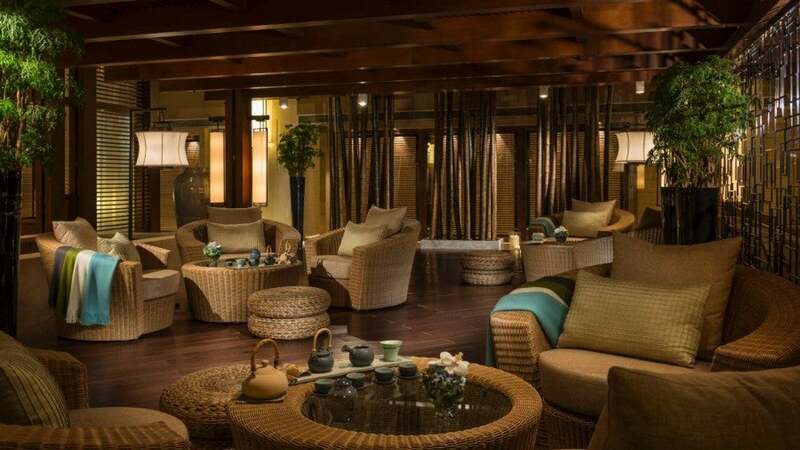 The Tea Room at the Four Seasons Beijing offers specialty teas and Chinese imperial snacks. The Four Seasons Beijing: Boasting five-star status, this hotel has 313 guest rooms, 66 suites and one Imperial Suite, all with specially designed areas to separate sleeping and living spaces. Each room includes an iPod docking station, flatscreen TV, WiFi, and complimentary overnight shoe shine service. An expansive spa area includes a 20-meter (65 foot) swimming pool, adjacent Jacuzzi, sauna and poolside lounge chairs, along with a 1,259-square-foot weight and cardio room. The Four Seasons concierge service makes the hotel family friendly, with baby-sitting services, child-size bathrobes and children’s toiletries. The Tea Garden provides a serene escape from the bustle of Beijing with specialty teas and Chinese imperial snacks, and more extensive dining options are available at Cai Yi Xuan, Mio and the Chef’s Table, while the Opus Lounge and Bar respectively offer everything from buffet breakfast and afternoon tea to contemporary specialty cocktails. Room rates start at 1,742 CNY ($284) per night in June. Book at least seven days in advance for a 15% discount. The deluxe suite at the Peninsula Beijing hotel is on two floors separated by a staircase. The Peninsula Beijing: This property is centrally located just minutes from the Forbidden City and features 525 rooms all with 42-inch flatscreen TVs, marble bathtubs and the choice of broadband or WiFi Internet. The suites also offer MP3/4 connectivity so that guests can play their own music or videos through the hotel system, a DVD player and a movie library, while the duplex suite have floor-to-ceiling windows and two floors connected by winding stairs. The fully equipped fitness center has personal trainers on hand, or alternatively guests can dive into the heated swimming pool. Four dining options offer high-quality Cantonese, international and Asian cuisine. The “Naturally Peninsula” program also offers health-conscious cuisine created by a staff nutritionist. Room rates start at CNY 1,400 CNY ($228) per night in June. The gallery at the Opposite House boutique hotel displays sculptures by artists from Asia, Australia and Europe. The Opposite House: This boutique-style hotel located in the trendy Taikoo Li Sanlitun area blends old and new Beijing into 98 contemporary studios (plus a two-floor penthouse), each with spa-inspired bathrooms, deep oak soaking tubs and rain showers. Some suites also have dining areas, Jacuzzis, private balconies and Nespresso coffee machines. Complimentary mini-bar and WiFi are included, as are a Denon in-room entertainment system and LCD television. There is a fully-quipped fitness center, 22 meter (72 feet) stainless steel pool, sauna and spa. The ground floor of the hotel is a gallery featuring sculptures by artists from Asia, Australia and England. There are three choices of dining from an eclectic café to a Mediterranean restaurant. Room rates start at 2,650 CNY ($400) per night in June. 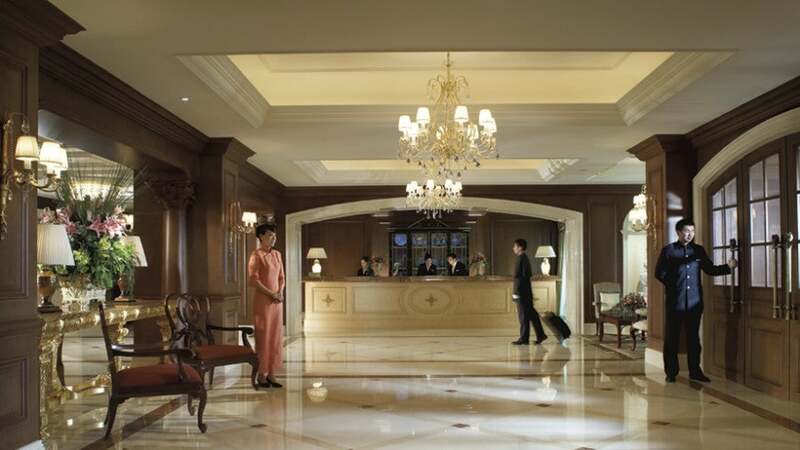 The historic Raffles Beijing located on the ‘Street of Eternal Peace’ is also part of Amex Fine Hotels & Resorts. Other properties in the program include the Grand Hyatt Beijing, the Ritz Carlton Beijing, Financial Street, a glittering glass and chrome building downtown and the Ritz Carlton Beijing in China Central Place, the St. Regis Beijing, and the traditionally designed Aman Summer Palace, Beijing. The grandiose lobby of the 278-room Shangri-La China World Summit Wing hotel. Shangri-La China World Summit Wing: Located adjacent to the China World Trade Centre, this hotel has 278 rooms located on floors 64 to 77 of the high-rise building, all with floor-to-ceiling windows. They also feature marble bathrooms with soaking tubs with 15-inch flatscreen TVs located in the mirror and L’Occitane bath products. The main in-room entertainment is a 40-inch flat screen TV with in-house movie channel, iPod docking station, DVD player, and complimentary WiFi. Guests can relax in the indoor infinity pool, or get a massage 77 floors above the city at CHI, The Spa. Four dining options offer a choice of high-class cuisine, along with the more casual tea lounge and wine bar. Room rates start at 2,200 CNY ($409) per night in June. The towering Fairmont Beijing has 222 guest rooms and suites from the 5th to the 16th floors. The Fairmont Beijing: Located in the central business district, this hotel has 222 guest rooms and suites from the 5th to the 16th floors featuring 400-count linen, spa-inspired bath tubs with four-point programming and flatscreen TVs. The main room has a state-of-the-art work area with broadband and wireless high-speed Internet options, another 42-inch plasma TV, Bose radio and music system with connection kit for an iPod, a DVD player and a Nespresso coffee maker. The Willow Tree Spa on the 21st floor has 12 private treatment suites offering a blend of Western and traditional Chinese treatments. The fitness area includes a heated swimming pool, state-of-the-art gym equipment by TechnoGym, yoga studio and Jacuzzi. There are three choices of drinking and dining – craft steakhouse The Cut, Lunar 8, the lobby lounge bar or the champagne bar. Room rates start at 2,100 CNY ($342) per night in June. Other Visa Signature properties are five star hotels Regent Beijing and Grand Hyatt Beijing, the Park Hyatt Beijing, St. Regis Beijing and the Raffles Beijing.